People who have asthma and other respiratory illnesses are undoubtedly familiar with the pulse oximeter. The device is also a great help to nurses, pilots, mountain climbers, and athletes. The question now is how to choose the best pulse oximeter. This article will help narrow down your search. Oximetry is a way to check a person's arterial blood oxygen saturation (SpO2) and pulse rate. The two are vital signs for any patient. The device used in oximetry is called a pulse oximeter and is employed in clinics, emergency rooms, hospitals, operating rooms and even at home. It's noninvasive, so the patient won't have to contend with needles. Moreover, a pulse oximeter is fast and can give an accurate reading in a span of seconds. 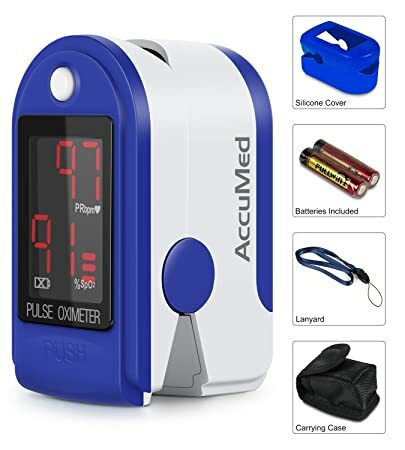 Pulse oximeters are used medically in patients who have asthma, chronic obstructive pulmonary disease (COPD), chronic obstructive airway disease (COAD), emphysema and other respiratory problems. But it's also used by pilots and mountain climbers as a way to watch out for hypoxia. Athletes also use pulse oximeters in their high altitude training. An oximeter is an important medical tool. There are several types of oximeters used in diagnostic procedures – fetal oximeter, finger pulse oximeter, handheld oximeter and wrist pulse oximeter. This oximeter is specially designed to diagnose the baby's health. As the typical oximeter's hard to place on a newborn, the fetal pulse oximeter is designed with a probe to put on the baby's head. Light rays then get a reading from the baby's skull, giving doctors vital information about the infant's health and whether there are complications that need immediate treatment. The finger pulse oximeter is the most commonly used oximeter. It's similar in design to an alligator clip, with the sensor placed on either a finger or an earlobe. The infrared light then passes through the veins to record the difference between oxygenated and unoxygenated blood cells. The result appears on a screen in the clip. The pulse oximeter's portability makes it accessible, with patients able to use it at home. The most sophisticated oximeter, this machine utilizes a clip that can be attached to a finger or a toe. Infrared ray passes through the clip, and a cable is connected to a screen that shows the result. The handheld oximeter shows more than the patient's oxygenated blood level. The patient wears this pulse oximeter around his/her wrist. The device is designed for convenience and flexibility. It's also used for overnight monitoring of blood oxygen saturation levels. The wristwatch unit then displays the readings. The device is capable of storing up to 500 hours of data. Before you buy a pulse oximeter, you need first to be certain of its use. Will you use it for checking your oxygen levels from time to time or do you have an illness that requires constant monitoring of blood oxygen levels? 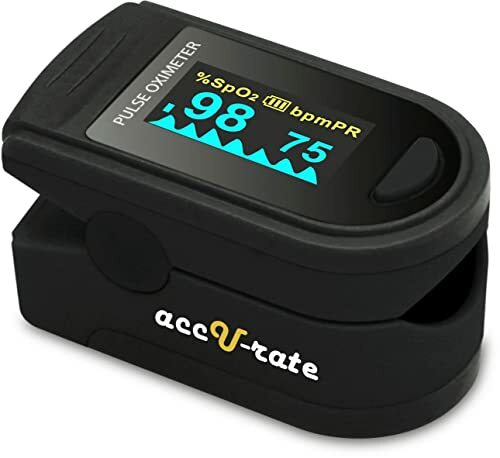 Accuracy: Since the primary function of a pulse oximeter is to measure oxygen saturation and pulse rate, you want a device that's accurate to give or take 2% of actual SpO2 levels and up to 70% of oxygen saturation levels. This feature is crucial for the device to give a precise reading even when SpO2 levels are less than optimal. To check for accuracy: Compare your pulse oximeter with other models, like those in health clinics or your doctor's office. Remember that the accuracy of the device is also affected by motion, so if your hand has a tendency to tremble, choose a model that's tolerant of movements. Durability: The best pulse oximeter is durable, well able to withstand being dropped on the ground. You should also check if it's waterproof and can withstand humidity. This function is particularly crucial for oximeters used for constant monitoring. FDA certification: An FDA certification is required before a company can sell a pulse oximeter. While most oximeters out in the market are certified, you should do your due diligence and check with the FDA Medical Device Data Base. ​Portability: Most users prefer a pulse oximeter that's easy to carry, especially if it's being used for sport or on-the-job. If this is the case, look for a device that can be carried around the neck, placed in a pocket or clipped on a belt or holster. ​The size of sensor: Finger pulse oximeters require the user to insert a finger into the sensor and pressing a button. Check that your finger fits comfortably in the sensor. The wrong sensor size can cause the clip to either squeeze too hard or not hard enough. Opt for a device with adjustable sensors. ​Visible Display: A pulse oximeter with a bright display screen doesn't just look good, it's also essential for readings to be seen quickly and clearly. Try to choose an oximeter with a backlit display or one with adjustable brightness settings. You want one that can show the display screen clearly under any lighting conditions. Another feature to consider is a screen that can be viewed clearly from different angles. Weight: Just because a unit is small doesn't mean it's light. Some brands of pulse oximeters are still heavy or uncomfortable to use. Choose a device with a weight that feels comfortable for you. Remember that heavy oximeters might also be more prone to damage when dropped. 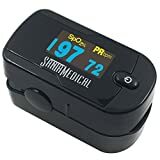 Choosing the best pulse oximeter can be overwhelming, especially with the massive amount of oximeters out on the market today. To help you make a decision, here are some of the top oximeters based on reviews and features. Just upgraded, the SantaMedical Generation 2 is one of the more affordable and accurate ways to gauge one's blood oxygen saturation levels and pulse measurements. The device is light, portable and constructed from medical grade plastic. It's also easy to operate and comes with an auto power off function. The SantaMedical Generation 2 is also ideal for athletes, pilots and those who're always on the move. Bright OLED display. The device has a rotating screen so results can be viewed in different directions. ​Multi-functional. Accurately measures SpO2 level and pulse rate. Also shows pulse wave, bar graph, and battery level. Designed with a self-adjusting finger clamp. Difficult to put in batteries. 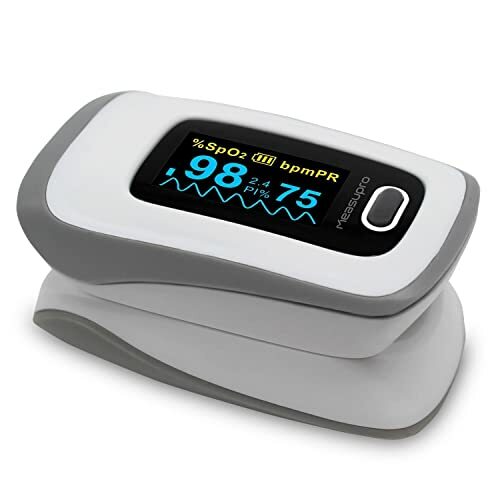 Manufactured according to the strict standards of the CE and FDA, the ACC U Rate Pro Series CMS 500D Deluxe is the pulse oximeter of choice by numerous health professionals. The portable unit is said to work quickly and accurately. The device shows SpO2 levels, pulse rates, and pulse strength on a high-quality OLED screen. It also comes with threshold settings that can be customized. The ACC U Rate Pro Series CMS 500D Deluxe comes with a durable case. It's also a great unit for athletes and health aficionados. FDA approved – designed to meet the strict standards of doctors and health professionals. Perfect for bikers, skiers, mountain climbers and other athletes. ​Bright OLED display with a plethysmograph. The screen rotates for easy viewing and brightness level can be adjusted. An alarm can be activated when SpO2 and pulse rates go beyond acceptable limits. There's also an option for pulse activated beeps. Uneven battery life. Several users have complained of device shutting down after one week of use. The ACC U CMS 500D can't be used during exercise. Readings have to be taken before or after the activity. The CMS-50DL is designed to monitor heart rate, pulse rate, and blood oxygen circulation. The device boasts of a crisp digital LED display with ambient light that makes it easier to read the results. The unit is easy to use and gives readings in a matter of seconds. It also comes with an auto power off function and a sturdy case. The unit is also well-suited for athletes, pilots, and exercise buffs. Screen consumes less power, allowing for the device to be used continuously for 24 hours. Patient has to remain very still for the device to get a reading. Protective rubber case tends to fall off. The device is designed for accuracy and gives readings for pulse rate, blood oxygen saturation, and perfusion index. Easy to use and comes with a bright, rotating display. It's also flexible and adjustable, allowing users to set individual limits. Accurate and reliable - SpO2 measurement accurate to 2% (plus or minus) with a 35%-100% range. Pulse rate accurate to 2 bpm (plus or minus) with a 25-250 bpm measurement range. ​Enhanced alarm features. The unit produces beeping sound for every pulse. Alarm activates when SpO2 or pulse rate is above the set limit. Alarm feature also has a silent mode. Instructions for installing batteries are unclear. Back cover made of soft plastic. 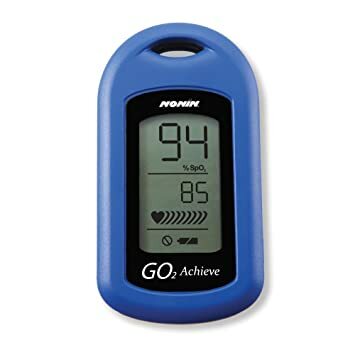 The Nonin Medical Go2 Achieve is the pulse oximeter of choice of respiratory therapists. The device is a bit pricey but well worth it. It uses the patented Pure SAT pulse oximetry technology which gives accurate readings even for people with dark skin tones or in situations where there's low perfusion. The GO2 Achieve is made from superior materials and can be used by children and adults alike. ​Long battery life. One user claimed to change batteries once a year. The unit does not work in oxygen rich environment. Battery cover tends to break off. Out of the five pulse oximeters, the SantaMedical Generation 2 clearly stands out. The recently upgraded model is multifunctional, showing more than just pulse rates and SpO2 levels. It also has a sleek design that makes reading the results easy. The self-adjusting finger sensor allows it to be used by children and adults alike. Deciding which is the best pulse oximeter for you can be challenging. However, a little research can do wonders in narrowing down your choices. Always remember what you'll be using the pulse oximeter for and consider what features are important to you.